Haze psychotropic effect of Sativa-Tropikanka and light coating effect of Indica can be observed. reduces anxiety disorder and provides with gradual reversal of deep depression. hairs are totally covered with crystals, so owing to appearance strain of Silver Haze obtained its name. high percentage of moisture. 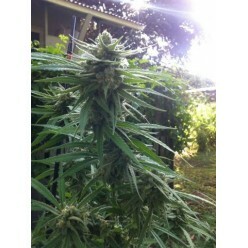 Silver Haze from Neuro Seeds is aimed at relaxation of body muscles. be used to ease chronic pain of different etiology.